Intense and passionate Tango by piano solo. Passionate and melancholic Tango by piano solo. Sentimental and elegant tune by piano solo in a soft Jazz style. Elegant Medium Rag by piano solo with a sentimental atmosphere in a 1930's style. Sparkling and joyful Rag for piano solo in a 1930's style. Medium Rag by piano solo with an elegant 1930's atmosphere. Sentimental and romantic tune by piano solo with a passionate atmosphere. Medium Rag by piano solo with an elegant atmosphere in a 1930's style. Passionate and melancholic tune for piano solo with a sentimental atmosphere. Sentimental and romantic theme by piano solo in a soft Jazz style. Brilliant and sparkling Waltz for piano solo in a 1930's Ragtime style. Comical and frisky Rag for piano solo in a 1930's ''Silent Film'' style. Sparkling and bright Rag for piano solo in a 1930's style. 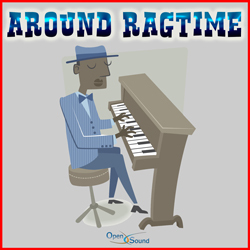 Medium Rag by piano solo with a frisky and playful 1930's atmosphere. Brilliant Boogie Woogie by piano solo in a 1930's style.